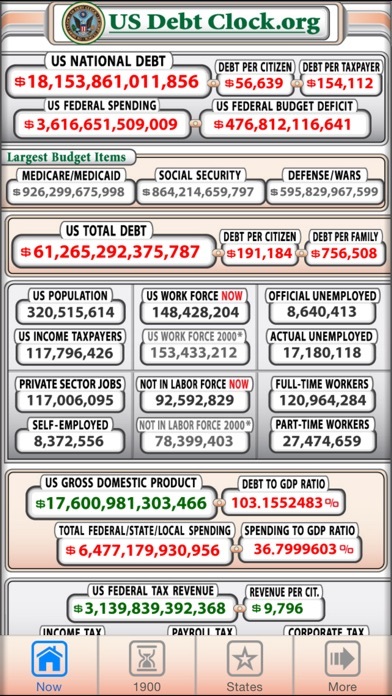 The US Debt Clock .org App gives you a Real-Time glimpse of the most relevant economic data showing the financial condition of the US Federal Government, the 50 States and the World with over 800, up to the Second Data Fields. • Go Back in Time to the Year 1900 to see the performance of each President, all the way forward until NOW. 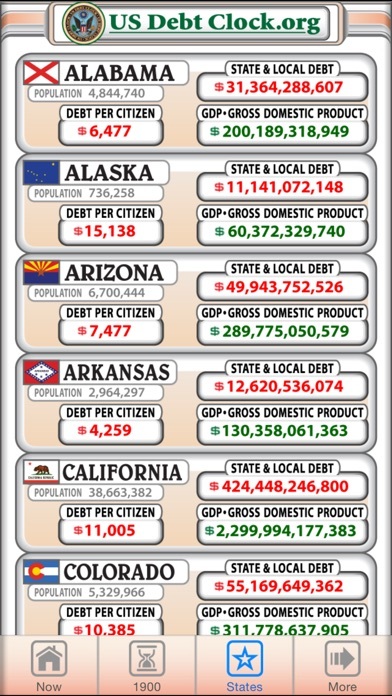 • Compare the Debt and GDP of all 50 US States. 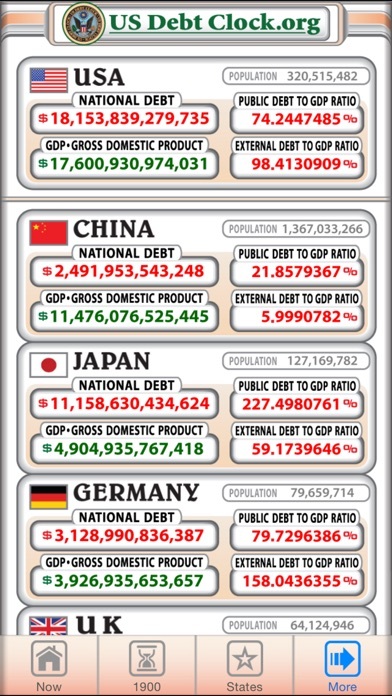 • See the World Debt Clock represented in US Dollars, and how each Country's Debt Level and GDP place them in the Global Economic System. • Federal Budget Showdown matches the CBO, OMB, HCB and USDC against each other, 4 years into the future. 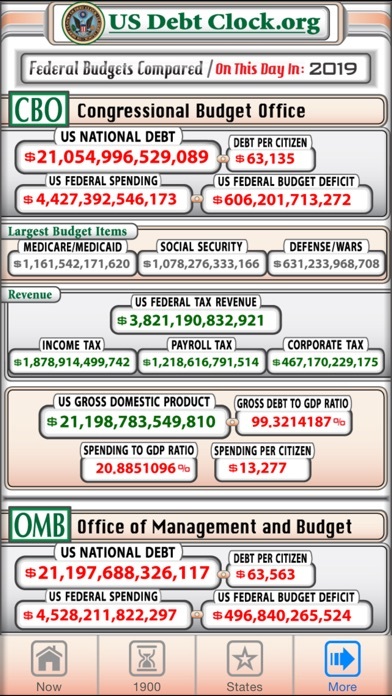 • Look into the Future to see the US Debt Clock in 4 Years at Current Rates. 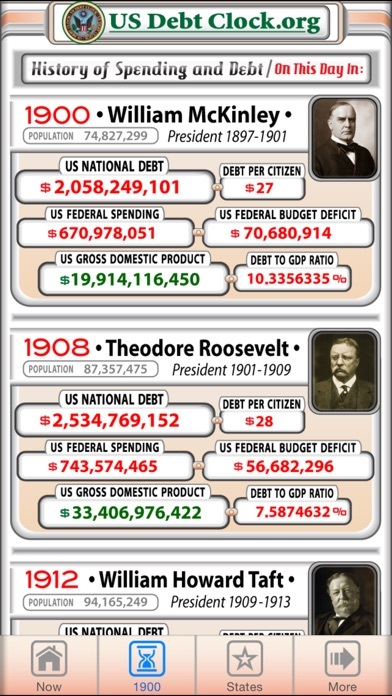 • Go Back by decade to see where US Debt Levels were in 1980, 1990, 2000 and 2010. • Travel Back in Time to the year 1100 for a complete History of Money and Banking. 10 minutes on app and decided to use the web site instead. Primarily purchased this app to view the presidential data, thinking it would be very interesting and well worth the two dollars. However, after reviewing the latest presidents, the data is not accurate and appears to be off by several years for Bush/Obama. Do not purchase this app if this is what you are interested in, and do not trust the data presented for the presidents. It is not accurate. $2.00 for an app that crashes my iPhone? Theft. Please fix the app and I’ll fix my review. Excellent way to frustrate you!! A lot of good info. Would have given a fifth star if it had a widget option. Hope to see a update with it. All U.S. taxpayers should be required to have this app and use it every time they demand an entitlement or a tax break. The piper is going to call one day and it won't be pretty! And to the people who politicized their reviews, read the explanation at the top of the list i.e. "On this day in...", then look at the big red year to figure it out. The 4 year forecast of median home at 32k cannot be right. Tried going to the app support to report there, but the link leads to a 404 error page. Easy to use, free app, from top sources with details on all aspects of US and global financial debt. Everyone should spend a few minutes in this app, to think, and try to change their part of the future.